Flashback to 2005, Killing floor was nothing more than an Unreal Tournament 2004 “total conversion mod” with interest from Tripwire. 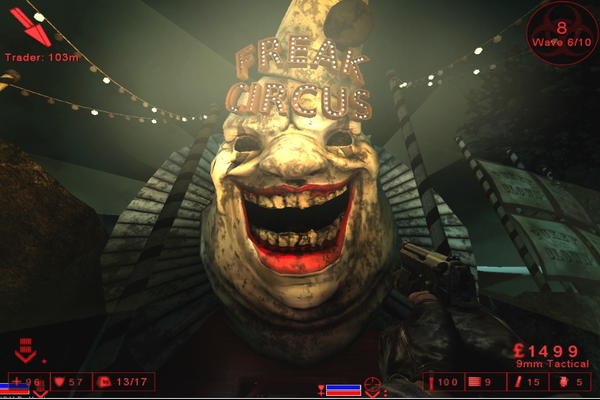 Flash forward to 2009 Killing Floor is released on Steam by developers Tripwire (with the help of some of the original team). 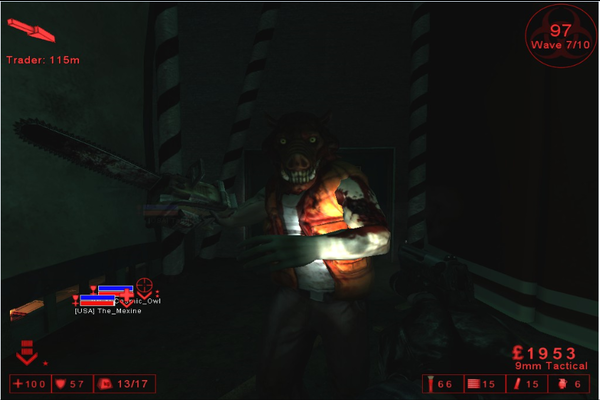 Flash forward to today and Killing Floor is still one of the best co-op experiences and horror shooters available to you. Utilizing a timed shop area as your main means of surviving (not unlike the counterstrike system) you will have to survive up to 10 waves of ever increasingly difficult enemies only to be greeted with the boss – the horrible “Patriarch” whom you will learn to despise. Prepare for a creepy yet exciting experience that you will definitely enjoy! You ready to have some fun? Good because this game is packed full of fun! First of all you’re going to want to choose a map, there is a large variety of stages to choose from along with a Steam Workshop setup providing more user created in game content for you to mess around with. You’ll start your first wave (by default) with a pistol, a flashlight attached to said pistol (with a recharging battery), some grenades, and a combat knife. These items take up one of your “blocks”, which are essentially a carry limit. These default items may not be removed so you have 14 “blocks” to play with, use them wisely. Most of your time spent in between rounds will be spent at the trader where you can buy an array of weaponry and equipment (some of which is part of varying DLC packs). Try not to get annoyed by the very obviously sexually frustrated trader woman (whom you will learn to despise more than the Patriarch) because you will be following her during the round to follow as the trader moves around quite a bit, plan accordingly! When playing, you will notice very soon that as you progress through waves, the standard and number of enemies increases quite a bit, so try and have a variety of weapons at the ready, you don’t want to be wasting precious rockets on the common infected and be left with a pistol when faced with a crazy, chainsaw wielding, hillbilly wolf (yes you read that correctly!). You will want to learn off how to deal with each specimen so that you are using your ammo as efficiently as possible. Of course, if you are playing on the highest difficulty I suggest that you throw the guidebook out the window and go on a killing spree, ammo be damned! As it is a PC game, Killing Floor has the option to change your key bindings so don’t fret if you can’t change weapons fast enough. The movement of the characters can be annoying at times, because it is somewhat stiff, however this contributes to the fear factor of the game and makes it more challenging, rather than a problem. 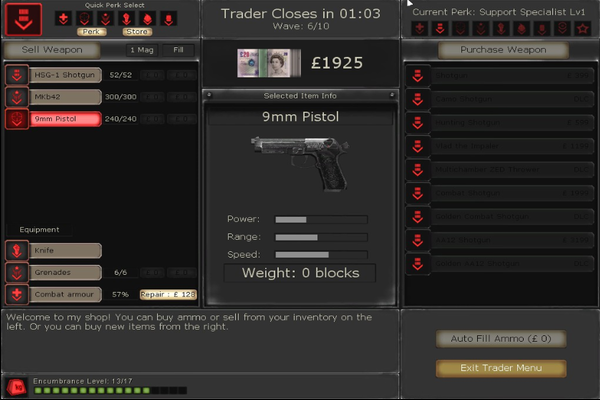 You cannot sprint, your speed is determined by how much items you are carrying, you also run slightly faster while holding your knife, which you will need to utilize quite often while you are playing on larger maps and need to get to the trader before she makes a crude innuendo and closes the shop. Graphics wise, the game is nothing special. It is totally playable and everything is clear, but it was released in 2009 and even then it wasn't the Crysis of the time so the graphics are average, but not bad at all by any means and they will not affect your playing experience (which is the most important thing really). Personally, I thoroughly enjoy playing Killing Floor and I can see myself playing it a lot more in the future, due to the high amount of events presented by tripwire. I prefer to play it with friends, or even people found through random servers because I can’t defeat the Patriarch on my own! I highly recommend buying this game, it tends to be on sale a lot on Steam and is even offered as a free game for a week from time to time. I hope that by reading this you have found yourself a new game to enjoy, like I have. Sidenote: I'm not sure I re-sized those images properly, sorry.